Whether it’s at a dinner party or movie night, the last thing you want to do is drop a big one in the guest bathroom, which often happens to be very inconveniently located next to the host’s kitchen. Even worse, your host may have neglected to equip the bathroom with air freshener, which could lead to all sorts of humiliation. As a first line of defense, always turn on the bathroom fan and water faucet immediately, so that the noise will cancel out any noise you may make while making and the smells are immediately exhausted. Try closing the sink drain and pumping some liquid soap into the water as the sink fills and presto, it’s your own DIY air freshener. If you are really paranoid, you can turn the water on and off as you go, to mask noise and simulate washing up. Turn off the fan and empty the sink before leaving the bathroom, and no one will ever know you were the smelly one. The best way to get rid of odor is to avoid it entirely by stopping it in its tracks. Bring along travel-size toilet tissue mist like Aquinelle, to wet and scent your toilet paper with one of six fresh fragrances. The act of misting your paper and applying it to your rear stops smells where they start. You can choose from Pink Grapefruit, Ocean Breeze, Citrus Burst, Island Mist, Rain Forest, and Coco Beach. So much better than the alternative scent. And misting your TP is better for the planet than flushing pre-moistened wipes. If you ask around, you will find that everyone has their office bathroom battle plan. Executives have private bathrooms or share quarters only with others at their level. Junior staff will wait to go when out to lunch or on another floor. Everyone is trying to avoid being that person who makes a big splash and smell when they void. To eliminate any unnecessary talk at the office when you eliminate, look around for other bathroom options when you really have to go. That way, you won’t have to worry that anyone can identify you by your shoes, and you won’t have to wait out a co-worker who is peeing in the next stall over. The same travel-size toilet tissue mist that wets your TP can also do double-duty as an air deodorizer. After you mist and wipe, just give an extra spritz or two to the air, and you are good to go, no matter what your quandary--guest bathroom, airport stall, or workplace toilet. Knowing that you left a place smelling better than you found it will make you feel a whole lot better, too. It’s a fact: The longer you sit on the bowl, the more smell you are going to generate. If you flush after each splash, you can cut your odor factor in half. True, it’s not the best environmental move, but this is a good trick to use when you are in an emergency situation--like when you are travelling with your supervisor and you are using the restroom first. Finally, it’s common medical knowledge that your diet has a direct impact on the smelliness of your stools. If you have a diet crammed with fried and sugary foods, refined carbohydrates, and generally lacking in fiber, you can be pretty sure that you are going to generate some pretty intense bathroom odor. Adding fiber with more fruits and vegetables and taking a probiotic supplement will not only add years to your life--it will also increase your intestinal tract health and and create fewer embarassing odors. 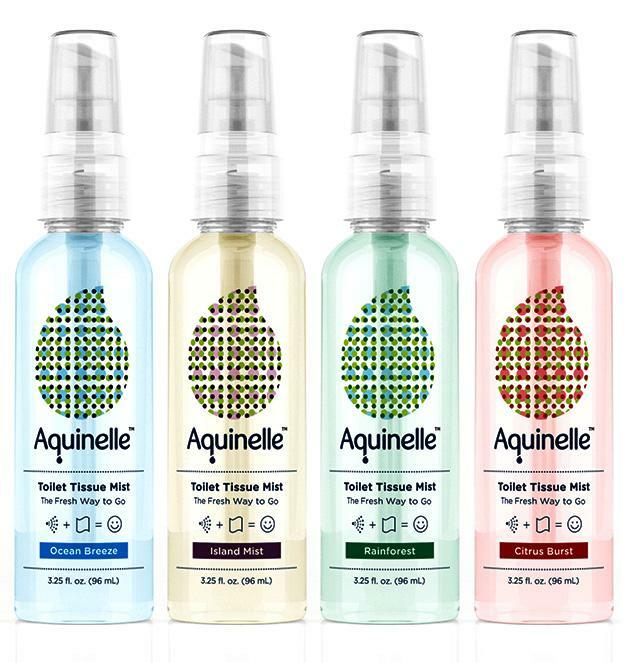 For more information on Aquinelle Toilet Tissue Mist, available in travel and standard sizes in six fresh scents,visit our website.